After a beautiful day of swimming, hiking, and eating at my favorite Pintxo bars, our TomTom navigated us along the 20 minute uphill drive from our hotel on the beach to our next dinner spot, Pedro Subijana’s Restaurante Akelaŕe. 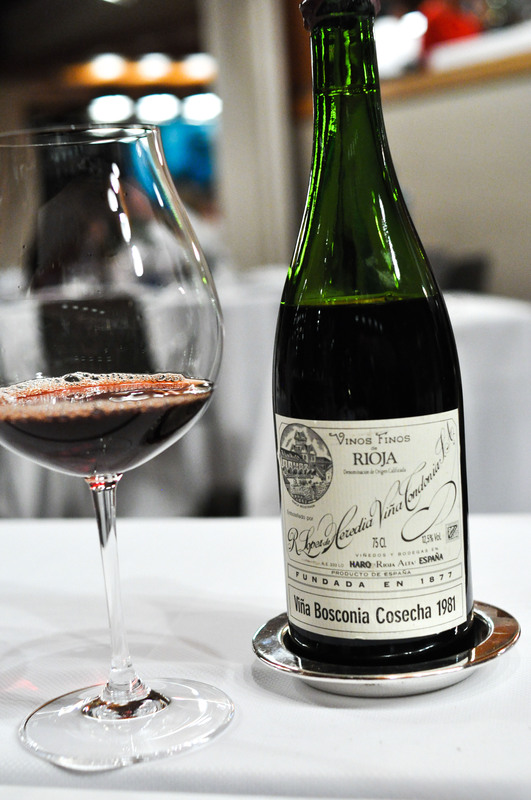 We were seated at a prime table next to a window overlooking the Bay of Biscay(which didn’t really matter since it was pitch black that night and we couldn’t see a thing outside (note to self: if I return…go for lunch)) As we settled in, we got started with some bubbles. To keep it easy, for beverages we just ordered a solid bottle of Cava, and a bottle of Rioja from my birth year by one of my favorite producers(who we visited the following week). For dinner we had to make a choice between the ‘Aranori’ or the ‘Bekarki’ menus. We opted for the Aranori, which overall looked more appealing. We were really in the mood for some postres, so we asked to be served the desserts from both menus. Sea Garden. A little sand box to begin. Crispy cod skin flavored with tomato. A cold mussel covered in chocolate that melted away nicely. 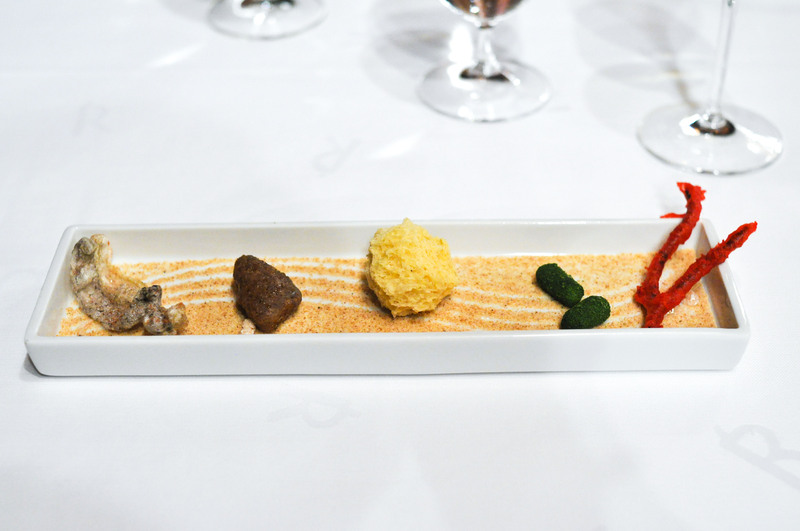 A savory sea urchin sponge cracker. ‘Beach Pebbles’ of shallot, corn, dill, and parsley. Tasty seaweed tempura ‘Coral’. A bed of edible prawn sand. Good ocean flavors and a fun start to the meal. Prawns and French Beans cooked in “Orujo” Fireplace. 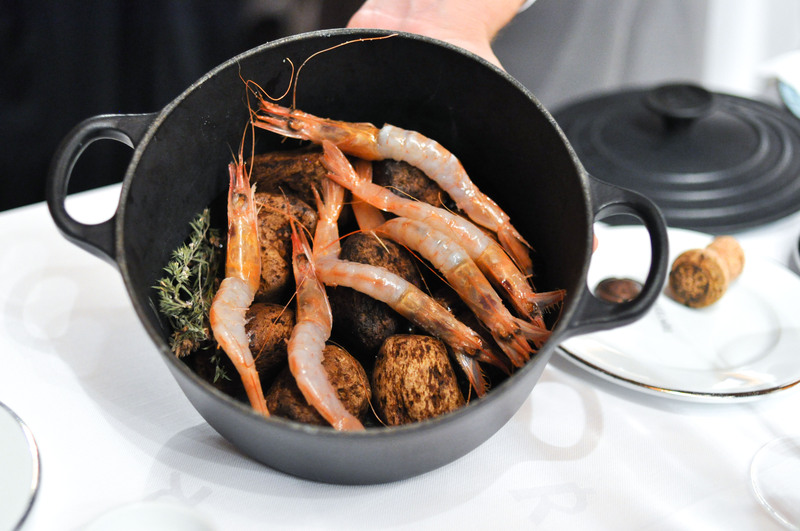 Wonderfully juicy Spanish prawns cooked perfectly table side over lava rocks with Orujo, a Spanish spirit similar to Grappa. 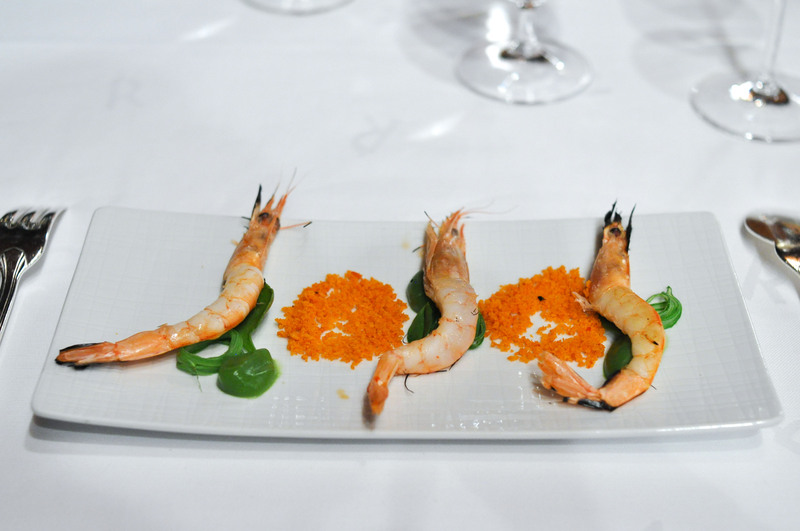 Served with green beans, green bean puree, and a crumble of shrimp shells and rice. A strong opener, and probably my favorite plate of the night. Mollusks in Fisherman’s net. A small selection of supple mollusks cooked over charcoal fire. 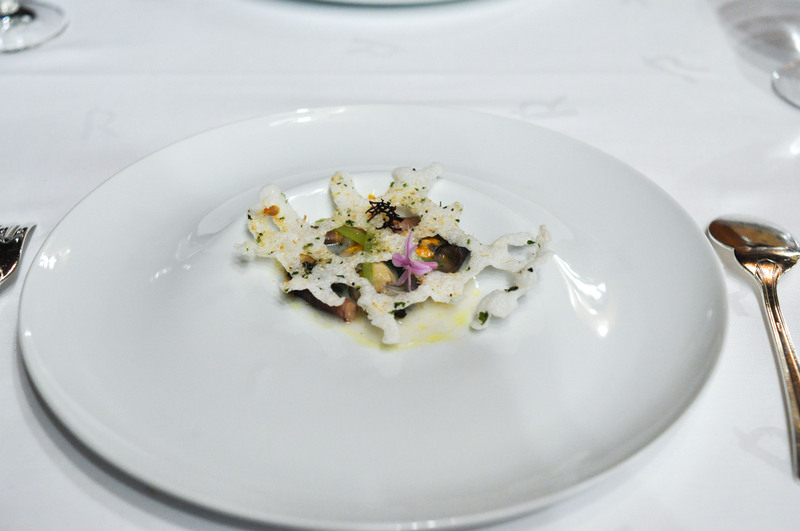 With rice and borage cream and a rice cracker ‘net’ that tasted like the sea as well. The garlic flower had a nice spice. 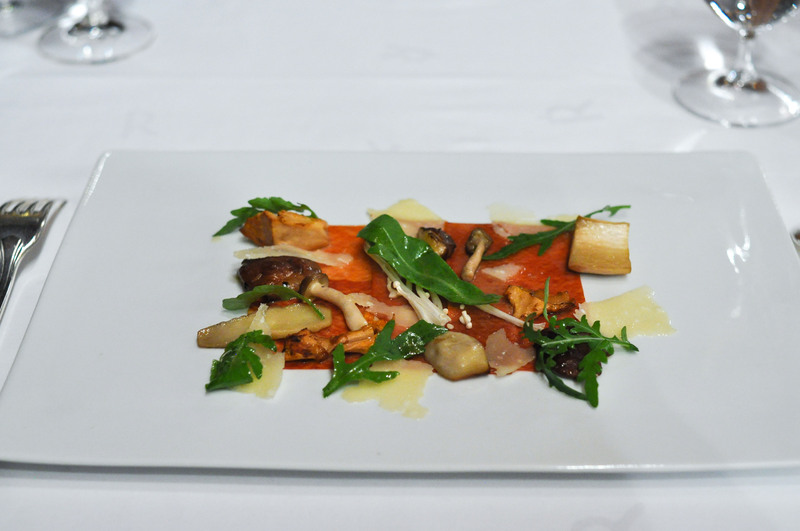 Pasta Carpaccio, Piquillo and Iberic with Parmesan shrooms. Sheeted pasta with intense ham and pepper flavor presented as a meat carpaccio. Amazing when paired with the parmesan and mushrooms. Hake, in Monkfish “Habit” and Mussel’s Beans. Hake breaded with monkfish dried skin that had a texture like rice krispies. Served over ‘beans’ made from mussels and rice. 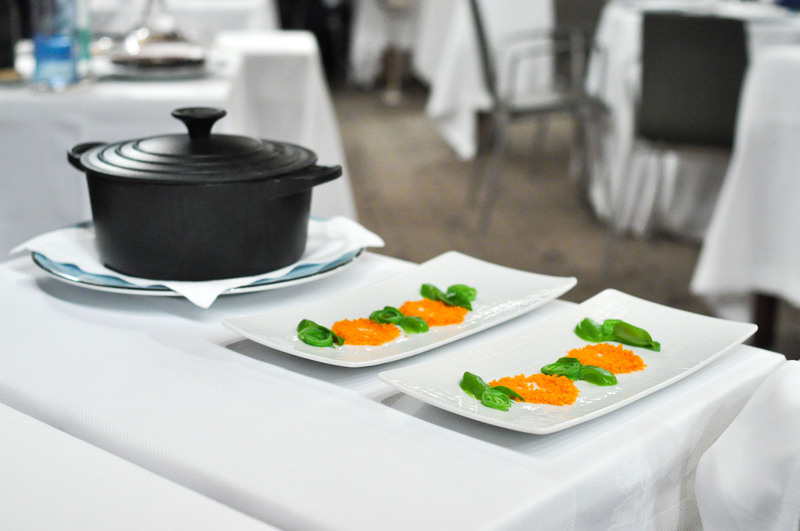 The Piparras, traditional Basque pickled green peppers, really enhanced the dish. Whole-Grain Red Mullet with Sauce “Fusili”. 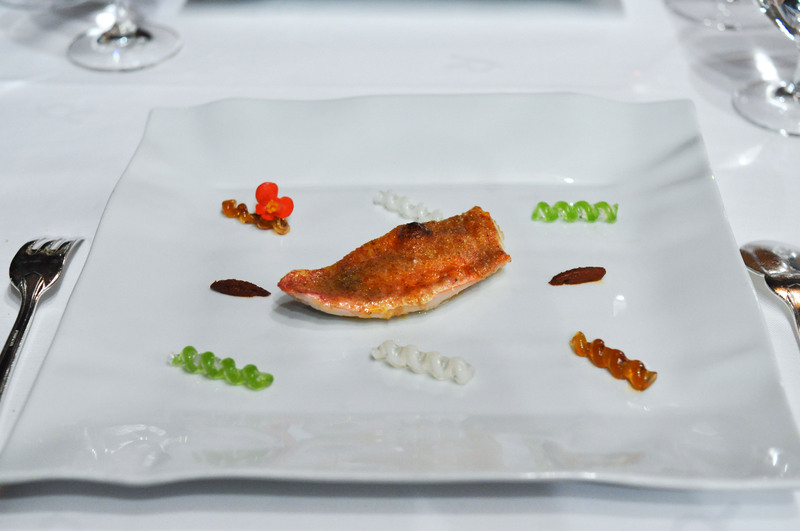 A flakey fillet of Red Mullet with a praline skin of head and bone served with a paste of liver and onion. Good stuff. The three sauces, parsley, soy, and ajo blanco, were fantastic, but I wish I didn’t have to eat the bland rubbery gelatin-like ‘fusili’ noodles to get to them. Roasted Pigeon with a Touch of Mole and Cocoa. 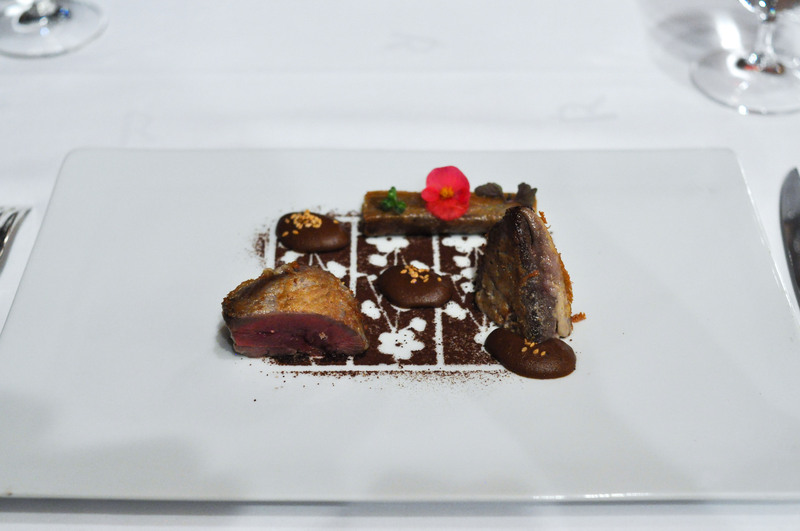 Slightly crisped, tender pigeon breast matched up with cocoa and mole and a ‘ravioli’ of pigeon leg in filo. A wonderful plate of bird. Around this time some of the staff started to shuffle around furniture and carry tables in and out of the dining room. I would expect that from a corner bistro towards the end of the night setting up for the next day’s brunch, but it was pretty surprising for a half full three star restaurant still in the middle of service. 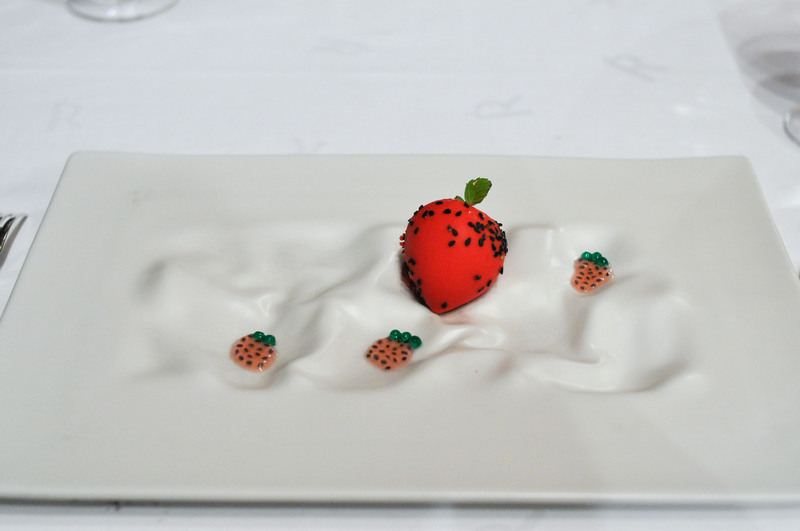 “Xaxu” and Coconut Iced Mousse. 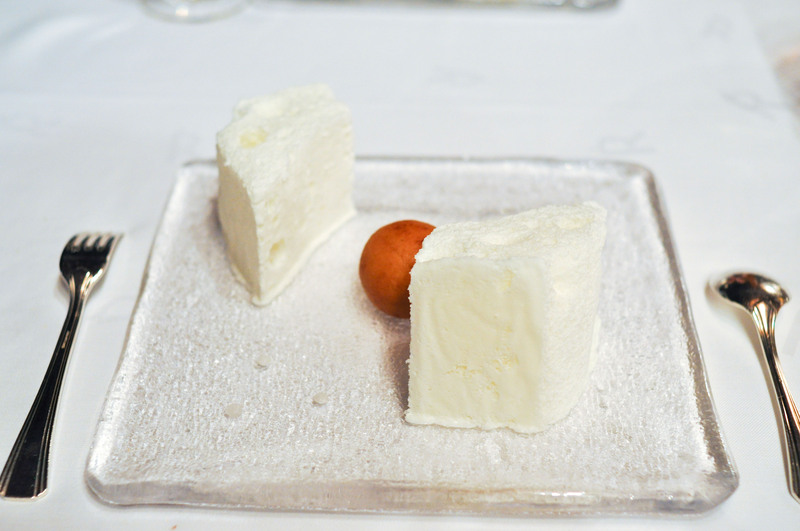 An egg and almond donut-like pastry served with light, aerated coconut ice cream. Rocky’s portion was at most half the size of mine and when the server dropped them, he teased her for having such a small serving(which she is still upset about). At the same time, Chef Subijana was arrogantly generously gracing us with a visit to our table and he also joked about how small Rocky’s dish was. Thanks Chef. 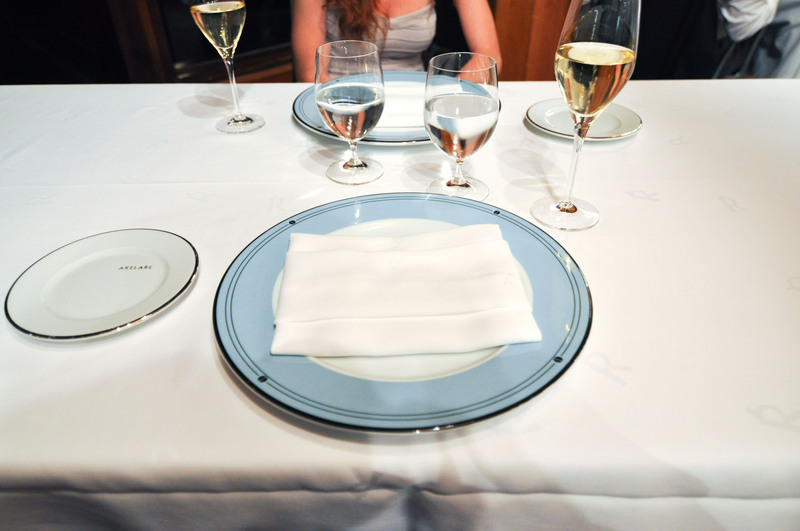 I didn’t know what real hospitality was until you made fun of my girlfriend and the measly plate you served her. Milk and Grape, Cheese and Wine in Parallel Evolution. 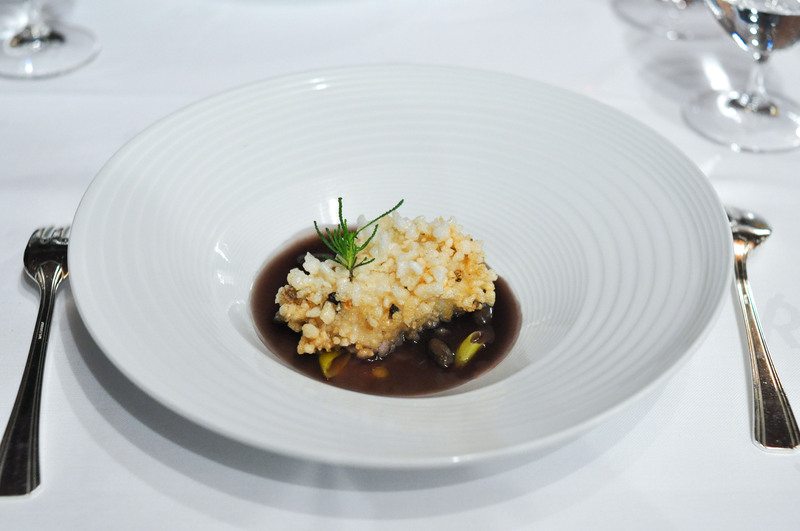 ‘Grapevine, curded sheep milk and walnut’ tasted like a bad egg dish. ‘Powdered fresh cream with chive and grapes’ was nice and clean. ‘Quark cheese with nutmeg and pink pepper aroma, must of tapioca and tomato’ was full flavored with good spice and season. 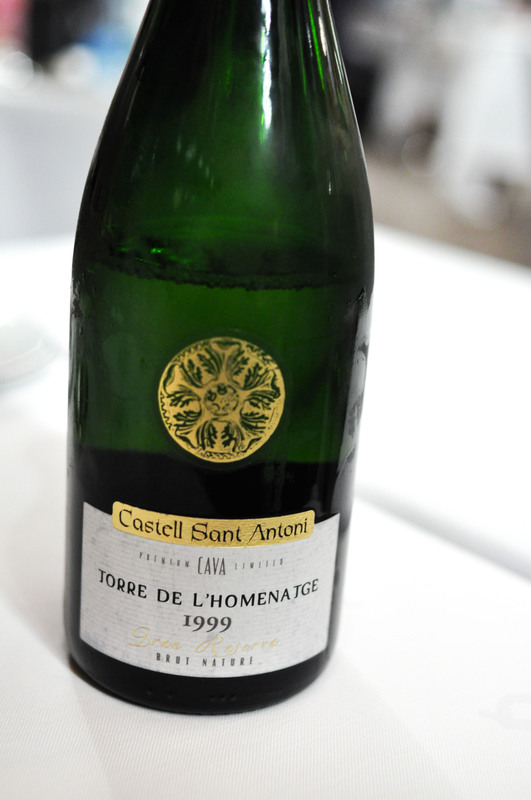 ‘Idiazabal semi-matured with quince jelly and wine dust’ was my favorite part, with great fruit balance. ‘Brandy sirop with Gorgonzola cheese ice cream’ I loved the blue cheese ice cream. 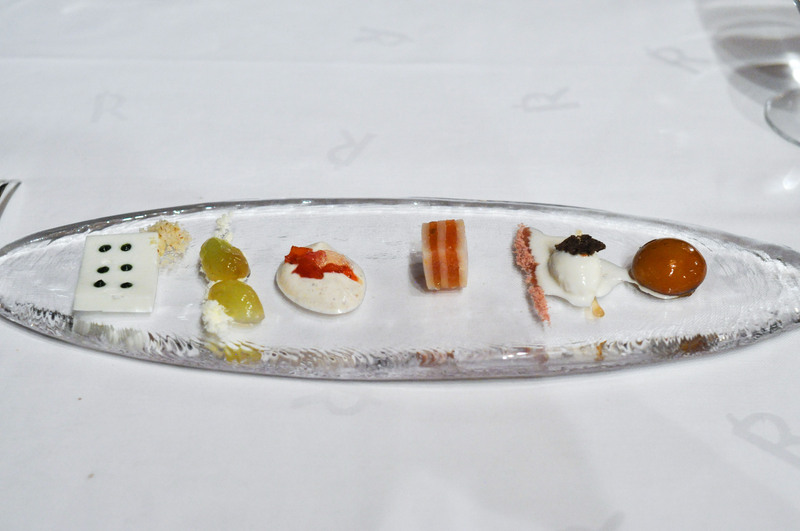 ‘Torta of Casar’s grape with soaked raisins in Pedro Ximenez’ had a good sugar to acid ratio. A Different Apple Tart. 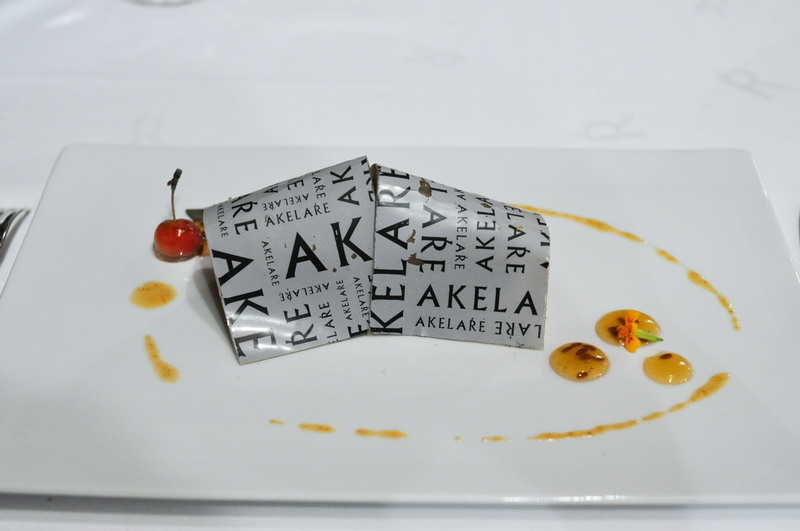 Hiding under a tasty fruit-rollup-esque ‘apple paper’ was a gorgeous apple tart. 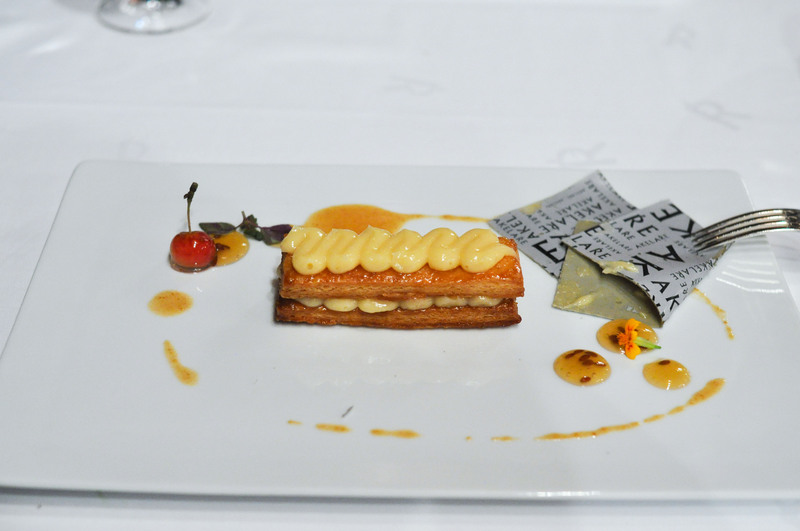 Toasted puff pastry layered with apple cream with a nice praline, apple cider sauce, and a ‘mini apple’. Quite a skillfully made pastry. Bravo. Layered Strawberry and Cream. 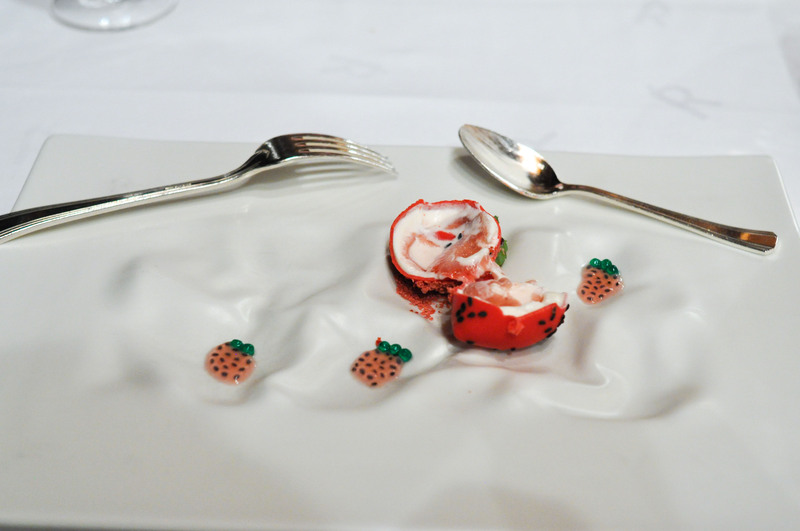 A reconstructed strawberry. The chocolate shell was good. Basil seeds in a strawberry liquor were fun. The basil leaf gave a great herbaceous pop; I wish they had given me more leaves. 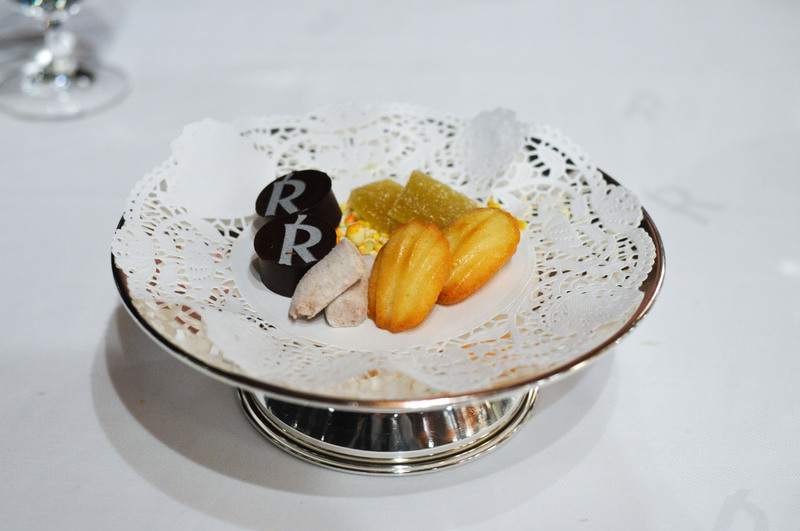 Petit fours. Almond madelines. Pineapple pate-de-fruit. Green tea-red fruit-lime marshmallows. Vanilla candy. Chocolates. 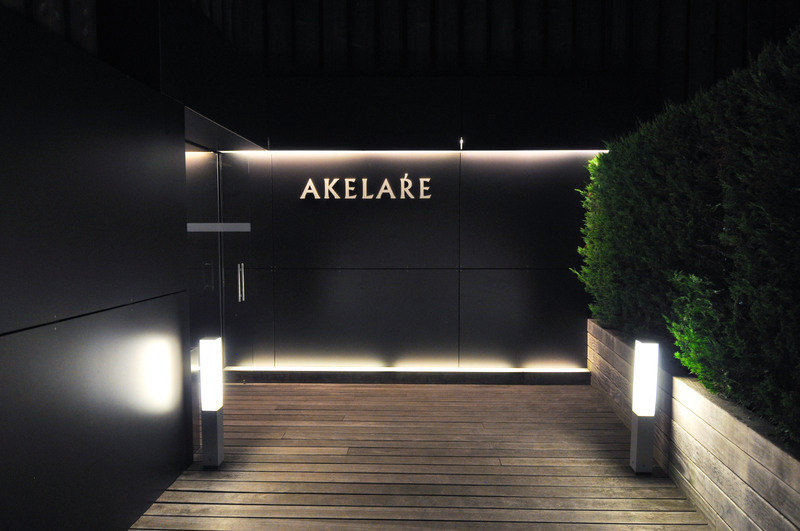 Restaurante Akelaŕe. Paseo Padre Orcolaga, 56. San Sebastian, Spain.